Slow down. 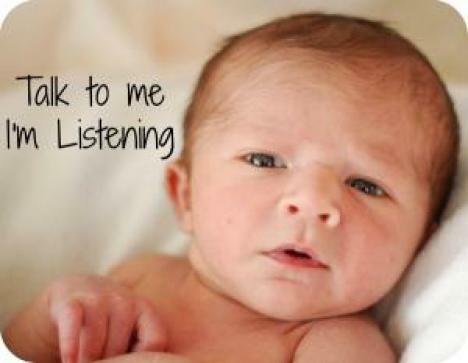 When baby is starting to try to decode your jargon, fast talk will slow those efforts. To give your baby the chance to begin picking your words, you must speak more slowly, more clearly and more simply. Focus on single words. Continue running commentaries, but begin emphasizing individual words and simple phrases commonly used in baby’s everyday life. At feeding time, when you say, ‘I’m putting juice in the cup’, hold up the juice and add, here is the juice’, and the cup, and say, ‘Cup’. Always pause to give baby plenty of time to decipher your words before going on to say more. Continue to downplay pronouns. Pronouns are still confusing for your baby, so stick to ‘This is Mommy’s book’, and ‘That is Jordan’s doll. Emphasize imitation. Now that the number of sounds your baby makes is growing, so is the fun you can have imitating each other. While conversations can be built around a few consonants and vowels. Baby says, ‘Ba-ba–ba–ba and you come back with an animated ‘Ba-ba-ba-ba‘ baby replies, ‘Da–da–da–da‘, and you response, ‘Da–da–da–da.’ If baby seems receptive, you can try offering some new syllables, encouraging imitation. But if the role reversal seems to turn baby off, switch back again. In not too many months, you’ll find your baby will begin trying to imitate your words – without prompting. Talk it up. Talk to your baby about everything – and anything – as you go about your day together. Be natural in your conversation, but with a baby-friendly inflection (not to be confused with ‘baby talk’). Build a repertoire of songs and rhymes. You may find it tedious having to repeat the same nursery rhymes or little ditty a dozen times a day every day. Your baby, however, will not only love the repetition, but learn from it. Whether you lean on Mother Goose, Dr Seuss, or your own creativity matters not, what count is consistency. Use books. Baby’s not ready for listening to stories yet, but simple rhymes in books with vivid pictures often catch even a young infants attention. Do plenty of pointing out of single objects, animals or people. Start asking, ‘Where is the dog?’ and eventually placing a pudgy finger right on Spot. Wait for a response. Though baby may not be talking yet, he or she is starting to process information, and often will have a response to what you say – even if it’s just an excited squeal (when you’ve proposed a walk in the pushchair) or a pouty whimper (when you’ve announced it’s time to come off the swing). Be commanding. In time, your baby will learn to follow simple commands such as ‘Kiss Grandma’ or ‘Wave bye-bye’, or ‘Give Mommy the dolly’. But keep in mind that baby won’t follow through on you requests for months to come, and even when he or she begins to, the response won’t be consistent or immediate. Don’t show disappointment when baby doesn’t perform. Instead, help your child to act out your request, and eventually he or she will catch on. Once that happens, try not to treat your baby like a trained seal, asking for performances of the latest ‘trick’ whenever there’s an audience (as tempting as it will be to show baby off).